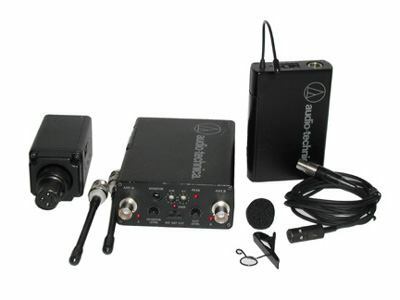 AT8340 - Input cable connects mics with 3-pin XLRM-type output to ATW-T101(x) body-pack transmitter. 4.3' (1.3 m), XLRF to TA5F connectors. AT8341 - Output cable connects ATW-R100(x) receiver to camera or other device. 19" (0.5 m), XLRF to right-angle 3.5 mm stereo mini-plug. ATW-U101: Includes ATW-R100 receiver and ATW-T101 body-pack transmitter. ATW-U101x: Includes ATW-R100x receiver and ATW-T101x body-pack transmitter. ATW-U102: Includes ATW-R100 receiver and ATW-T102 plug-on transmitter. ATW-U102x: Includes ATW-R100x receiver and ATW-T102x plug-on transmitter. Line Input Impedance/Level: 100k ohms/3.16V max. input at 1 kHz, 1% T.H.D. *Except for operating frequencies, specifications for "x" and non-"x" units are identical.